Cavu Kitchen Bar has only been open a few months in the Hilton Vancouver Airport Hotel in Richmond, but it’s a great spot for delicious, approachable food that appeals to the locals and those from near and far away, alike. The name CAVU is a nod to the restaurant’s location in close proximity to YVR, and pays homage to all the travellers that walk through the hotel’s doors. It’s an acronym for “Ceiling and Visibility Unlimited,” and when I visited CAVU just before Christmas, I was delighted to experience a menu that was creative, but still approachable, and happily–the exact opposite of airline food. Classically French trained, Hancock grew up watching Wok With Yan, and was cooking dishes from the TV with a family friend who was a chef by the age of 10. He came up in high-end hotel restaurants like Diva at the Met and the Four Seasons. Seasonality is important to Hancock, and the menu will change often. 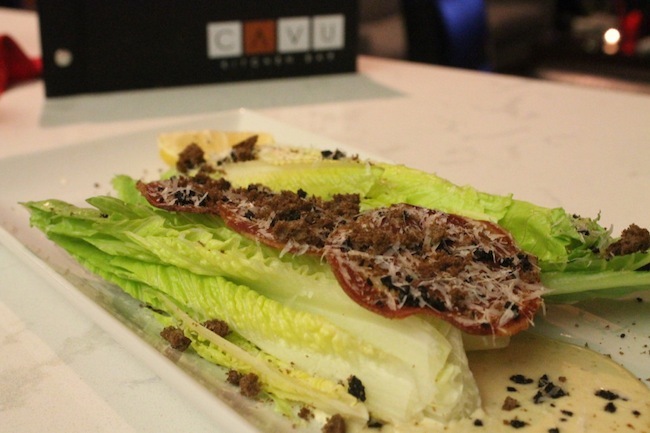 While he is classically trained, and appreciates the foundation he has in execution and organization, his challenge with CAVU is to keep it fresh, and reinvent those classic dishes. 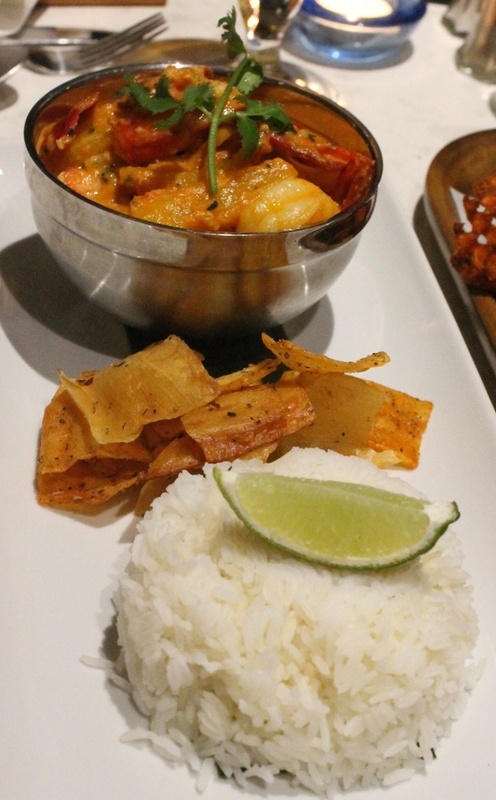 The result: lots of funky fusion that gives the menu a strong Canadian flavour. The menu is a bit of a United Nations–fitting for a restaurant so close to a huge international airport. You’ll find a Portugese Fisherman’s Stew, an Italian Pasta, a Greek Lamb dish, a Thai Beef Curry, and a Vietnamese Banh mi sandwich made with pork belly. 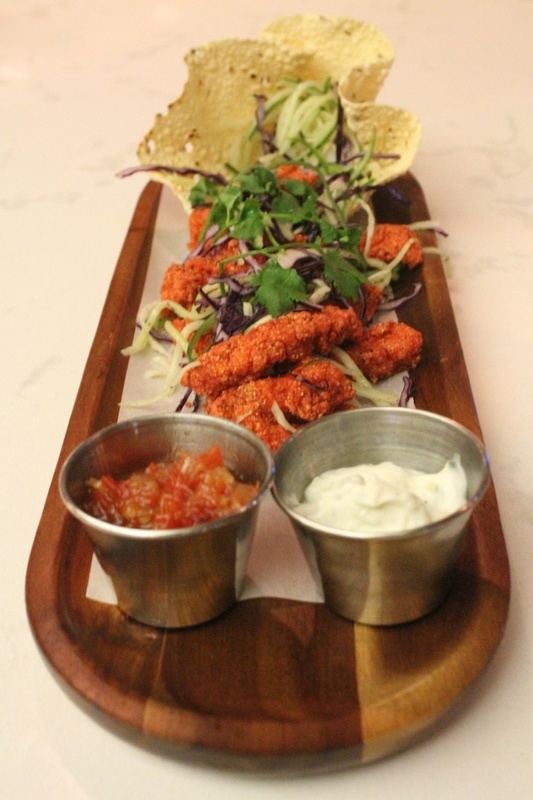 The Tandoori calamari was impressively tender, and surprisingly tandoori-spiced. Instead of fries with your burger or sandwich, you can get a side of “CAVU Crisps,” deep fried yucca chips with a loaded baked potato dip (sour cream and chives). I’d never had yucca chips before, but I’ll be making the drive to Richmond just to order these addictive, crispy bites. They are million times better than that tiny bag of stale pretzels they hand out on flights these days. One of their best sellers is the $25 Lobsta Burger, an 8 oz beef patty loaded with Atlantic lobster. Fish and chips is given a West-coast flair, made with salmon in a tempura batter, and those dreamy CAVU Crisps on the side. One thing they do here that I absolutely love is how they do dessert. Desserts are small, so you can try a variety of them without guilt. 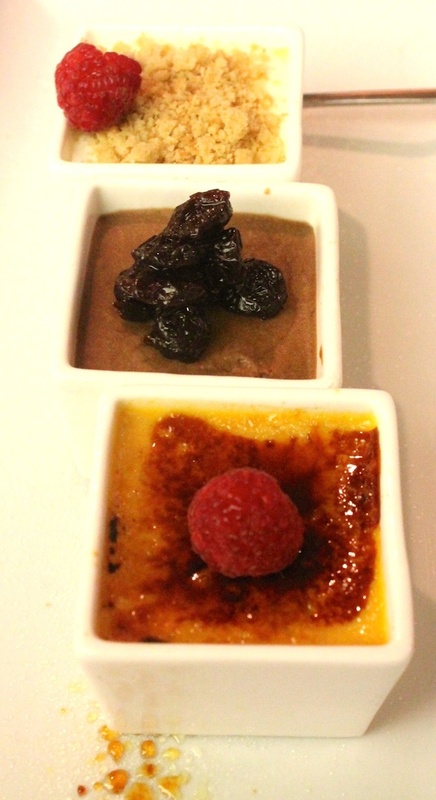 My pumpkin spiced creme brûlée had the perfect texture, and the chocolate mousse was rich and light at the same time. I especially loved the garnish–drunken dried cherries. My favourite, though, was the goat cheesecake–smooth and creamy, with the perfect touch of acid, topped with a textural crumb. There is a full cocktail menu here, as well, and a wine and beer list that includes lots of local selections. If you are a native of Richmond, you’re lucky to have CAVU. If you are not, it’s worth it to invent an excuse to take you across the bridge–and while you’re at it, you might as well have dinner. You have to eat, right? CAVU is unfussy, interesting, and accessible, worth the stop. Breakfast: 6 a.m. to 11 a.m.